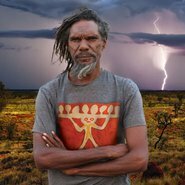 Putuparri and the rainmakers is a universal story about the sacred relationship between people and place. It takes audiences on a rare and emotional journey to meet the traditional rainmakers of Australia’s Great Sandy Desert who have fought a 20-year battle to win back their homeland. The film spans ten transformative years in the life of Tom 'Putuparri’ Lawford as he navigates the deep chasm between his Western upbringing and his growing determination to fight for his family’s homeland. A trip back to his grandparents’ country in the desert begins the process of cultural awakening. Putuparri is shocked to learn that there is a country called Kurtal and a snake spirit that is the subject of an elaborate rainmaking ritual. Putuparri is a man caught between two worlds: the deeply spiritual universe of his people’s culture and his life in modern society where he struggles with alcoholism and violence. As he reconnects with his ancestral lands and learns about culture, he begins to accept his future as a leader of his people and shoulders the responsibility to pass this knowledge on to the next generation. Set against the backdrop of the long fight for land rights, Putuparri and the rainmakers is an emotional, visually breathtaking story of love, hope and the survival of Aboriginal law and culture against all odds. The screening will be followed with a Q&A with producer Nicole Ma. Part of a quarterly series of Australian documentary screenings presented by the Gallery and the Documentary Australia Foundation. Each film takes inspiration from a Gallery exhibition; Putuparri and the rainmakers is presented in association with the exhibition Sentient lands .